If you like to keep it local, there are cruises from Durban and cruises from Cape Town to choose from for your holiday. Book today and enjoy the MSC Musica - here for one season only! Flights, 2 Night Stay and 7 Night Cruise! Spend two nights in Valencia, exploring Spain's third largest and sunniest city. 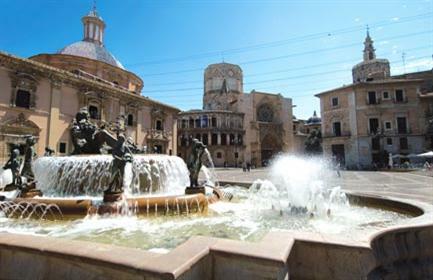 Built by the Romans, this ancient city has much to offer from historical architecture to a massive market to museums (biggest display of tin soldiers in any museum in the world!) to the largest oceanarium in Europe. 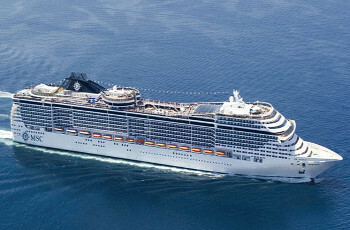 Then board the MSC Divina for a 9 night cruise with stops in Italy, France and Palma de Mallorca, before flying back home. To book, email us at cruises@southafrica.to, click on the buttons below or call us on 021-531-9638 or 021-531-7453. 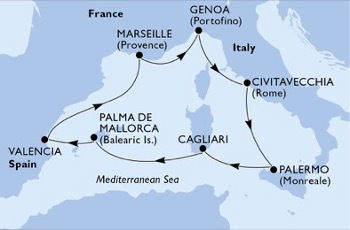 Included: return flights from Johannesburg to Valencia, Spain; 2 nights on a bed and breakfast basis in a hotel in Valencia, prior to the cruise; 7 night cruise (full board and lodging) on the MSC Divina; port charges, service fees; transfer from airport to hotel and harbour to airport. Price only valid for this departure date. Ask us for different dates that suit your travel needs. The prices below are PER PERSON, based on two adults sharing. There is limited availability on cabins. Price is subject to fluctuations in costs of flights and the cruise and the volatility of the Rand. *Terms and Conditions: Prices fluctuate constantly and may have already changed by the time you read this. Prices are only guaranteed once a booking has been made and terms and conditions pertaining to the booking are met. Prices are subject to availability of cabin category and change. Prices take into account discounts. Prices are an indication only & can change at any time based on the cost of flights at the time of booking and also remain subject to fuel cost fluctuations and fluctuation of the South African Rand. Limited availability on cabins. Standard terms and conditions apply. We are human and mistakes creep in despite our very best efforts to mitigate these, so E&OE.